Owner and Entrepreneur of Proof and Wood Ventures, Inc. Dave Schmier tells BourbonBlog.com that he has helped launch a limited edition Inauguration of The Presidential Dram Whiskeys Commemorate American Tradition Single Barrel Rye at 4-years-old and Single Barrel Bourbon at 8-years-old. This release is only available in the D.C. area during the POTUS Inauguration. 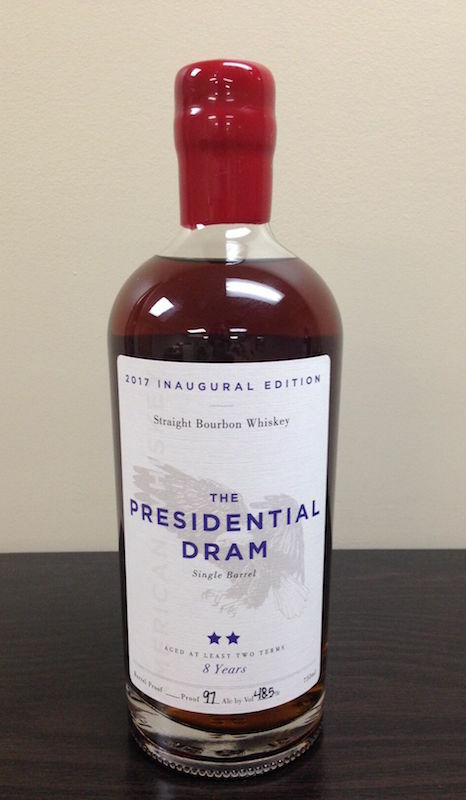 The Two Term Presidential Dram Bourbon is bottled at 97 proof and will be available for approximately $99.99, and the One Term Presidential Dram Rye is bottled at 120.9 proof for a suggested retail price of $79.99. The bottles are aptly red, white and blue – red and white label with blue wax for the Rye and blue and white label with red wax for the Bourbon. This will celebrate the commencement of a new four year term during the 58th Presidential Inauguration. The Single Barrel Whiskies are non-chill filtered, and bottled at the exact proof they exit the barrel. Both whiskies were distilled and aged in the historic distillery currently known as MGP Indiana, formerly Seagram’s distillery. The distillery has been producing American Whiskey since 1853. The whiskey is bottled in Bardstown, KY by Michael Kanbar’s Strong Spirits. The Presidential Dram whiskeys are the brainchild of Ledroit Distributing’s Michael Cherner and entrepreneur Dave Schmier. “Some who have seen the project questioned if one bottle is aimed at Democrats and one at Republicans,” Schmier tells us. “We aimed to celebrate an important moment in American tradition, without any additional political party affiliation. We feel the most heated debate in America should be Bourbon vs Rye; and unlike political voting, in this case you can choose both,” explains Schmier. Schmier tells us to be watching for what is ahead for the next term. The whiskey itself may be from another state. Subscribe to our Bourbon newsletter on this link for more updates like this.